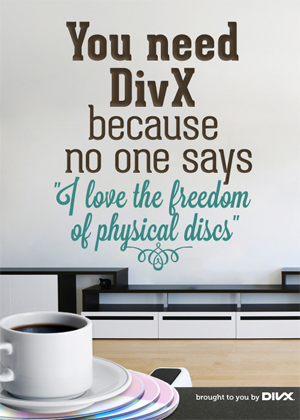 How and where do you get your DivX on? In your living room? On the subway? In your car? For a dozen years, people have turned to DivX to make their videos small and portable, while still playable at high quality. Now, thanks to DivX, you can watch a favorite movie or TV show practically anywhere. Here are 5 new ways to get your DivX on that I bet you didn’t know. Read on to find out how you can win one of these DivX Certified devices! Not long ago, an article came out on Lifehacker called What’s the Difference Between All These Video Formats, and Which One Should I Use? The article was a largely-useful breakdown of what the layman might need to know (and not know) about portable video formats. It talked about why video files need to be compressed and decompressed, gave a short history of codecs and containers, and pointed the reader toward a likely path to successful ripping and sharing of their favorite movies and TV shows. But like most simplifications of complex things, it got some parts…well, wrong. And of course we noticed the errors that had to do with DivX. Allow us to do a little DivX myth-busting!